We recently came back from a great vacation hiking along the North Shore of Lake Superior in Minnesota. I have some recipes that I will post from that trip, but this is a recipe I found on the way home. While taking some time enjoying the Twin Cities visiting places like the Como Park Zoo and some great bookstores, I found this recipe in a book that was on the bargain rack: The Sauce Book by Paul Gayler. As the name implies, it is a salsa with Asian flavors. I love the addition of ginger, mint and tamarind! 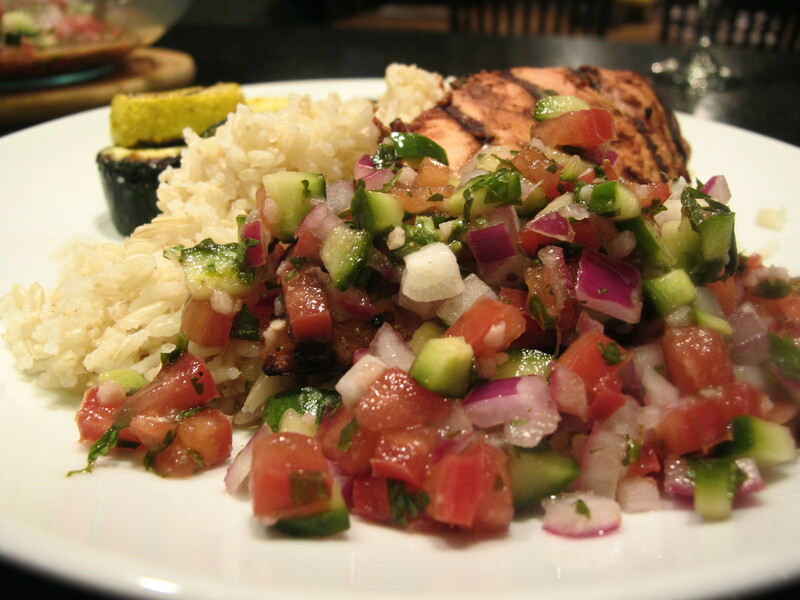 We served it with grilled chicken breast, but it would taste delicious over grilled fish or even a bowl of basmati rice. Combine all of the ingredients in a bowl, except for the salt and pepper. Cover and leave at room temperature for an hour. Add the salt and pepper before serving. Interesting! I can’t wait to try it! Beautiful combination of flavours. Thanks.